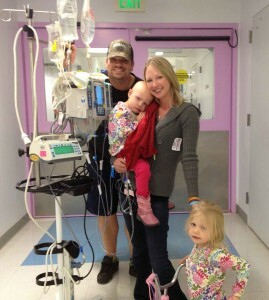 Talli’s counts took 3 weeks to recover again and her platelets were just getting so knocked down. She needed two platelet transfusions after her 14th chemo and at one point they got down to some pretty dangerous levels. Jon and I were starting to get pretty concerned with how much the chemo was starting to affect her. So when we went in for the 15th chemo on August 27th we discussed with her Team all of our concerns and they decided to lower the dosage by 20%. Also during that stay we discussed with them about how tight her hip has been…she can’t bend it well at all and of course we knew that after radiation it would have some tightness but her Doctor order an MRI just to see what that leg and hip were looking like. That day of her MRI was a tough one…she was tired and we waited most the day for her MRI. Poor baby hadn’t eaten for 20 hours. All three of us were on edge. The MRI took longer than expected so Jon and I let both of our minds go back to the beginning and we started freaking ourselves out…BUT it was all for nothing because one of our Doctors stayed later than he needed too just to show us the results…which looked amazing, no sign of tumor! We were so relieved. So we headed home that night and although they lowered the dosage it still took her forever to recover…she still needed a platelet transfusion and she still was miserable from being so backed up. We knew these end treatments would start affecting her worse than the beginning but it was so hard to watch…especially when we saw the MRI which looked like the perfect results. Our doctors all talked and had decided to lower the rest of her chemo dosages by 36%. This made us feel so much better! So when we went in for her 16th chemo on July 13th it was only a two day stay and Lexi was able to come. Talli tolerated that one so nicely and although she got backed up, it was nothing compared to before. She still had to get a platelet transfusion though. All in all it was so nice to see her feeling better and now we just have 1 chemo left!